Now, the re-united nation had a new president, Andrew Johnson. He had been Lincoln's vice president. The chief justice of the United States swore Johnson into office a few hours after Lincoln's death. 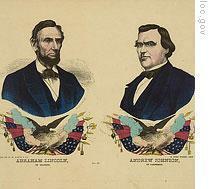 Most of Lincoln's cabinet was there, together with leading members of Congress. They looked to the new president with a mixture of shock and hope. This week in our series, Shep O'Neal and Tony Riggs begin the story of America's seventeenth president. Andrew Johnson was -- like Abraham Lincoln -- a man of the people. He was born in North Carolina. His family was poor. There was no money, or time, for young Andrew to go to school. When he was fourteen years old, his mother sent him to work for a tailor to learn to make clothes. Andrew worked hard. He opened his own tailoring business in the eastern part of the state of Tennessee. When he was eighteen, he married. His wife, Eliza, taught him to read and write. At the age of twenty-one, he was elected to the town council. Two years later, he became mayor of the town. At thirty-five, he won a seat in Congress, in Washington. Next, he became governor of Tennessee. Then the state made him one of its two senators. The poor tailor boy was a success. 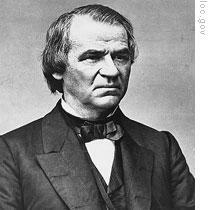 Andrew Johnson was a member of the Democratic Party. In the presidential election of eighteen-sixty, he supported his party's candidate, not the candidate of the Republican Party: Abraham Lincoln. But, Lincoln won the election. And, as a result, southern states carried out their earlier threat. They began leaving the Union to form their own nation. Johnson opposed this secession. He believed the South should remain part of the United States. He decided he had no choice but to support the Republican president. Most of the other citizens in Tennessee disagreed with him. They decided to leave the Union. Andrew Johnson had to flee his home to save his life. He returned only after Union forces took control of Tennessee and made him military governor. President Lincoln noticed the man from Tennessee who supported the Union over the opposition of others. In eighteen sixty-four, Lincoln decided to run for re-election. He chose Johnson to be his vice presidential candidate. Lincoln hoped Johnson would win the support of Union-loving Democrats. He hoped Johnson would help heal the wounds between North and South. 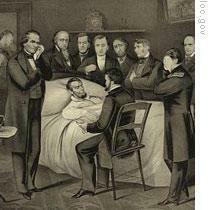 Now, Lincoln was dead. And Johnson was president. It was up to this little-known former tailor to make the decisions on reconstruction -- on rebuilding the Union. Johnson, not Lincoln, would decide if reconstruction would be easy or hard. Johnson would choose if the North would punish the defeated rebel states or be merciful to them. The radicals of Lincoln's Republican Party wanted severe reconstruction. They said the South was a defeated enemy. They demanded strong punishment for all southerners who took part in the rebellion. These radicals had disliked Lincoln's plans for reconstruction. They felt he was too weak. Now, they hoped Johnson would share their ideas. They urged him to call a special session of Congress to pass strong legislation against the South. The radicals had reason to believe the new president agreed with them. He had called the rebels traitors. He had demanded strong action against them when the war ended. "The time has come," Johnson had said, "when the American people should understand what crime is. And that it should be punished." But Andrew Johnson surprised the radicals. He did not call the special session of Congress. Instead, he announced his own program for the southern states. Johnson declared a pardon for all former confederates who promised to support the Union and obey laws against slavery. Then, he permitted former officials of the confederacy to run for office in their states' new elections. Many of these former rebels were elected. The radical Republicans were angry. They saw these elections as proof that the South had not really changed. They accused Johnson of being too soft. They urged him to punish the rebels. One radical newspaper wrote: "There is only one sure and safe policy for the immediate future. The North must remain the dictator of the republic until the spirit of the North shall become the spirit of the whole country. The South's treason is still unpunished. Southerners cannot be trusted. " The radicals also worried about what would happen to the recently freed slaves. They said the new state governments of the South would not treat blacks as free and equal citizens. As proof, they pointed to new laws the southern legislatures passed. For example, the state legislature in Mississippi said no black person could rent farmland. It said a black person needed special permission to work at any job except farming. Mississippi also passed a law saying a black person could be forced to work for a white man -- usually his former owner -- if he had no other job. Another way the state governments in the South acted against blacks was by refusing to give them the right to vote. The radical Republicans decided that President Johnson's reconstruction program must be stopped. They began working to get control of Congress to pass their own program. Only by gaining political power could they punish the South and guarantee full political rights to former slaves. The radicals tried to take control in two ways. First, they refused to let many of the recently elected southern congressmen take their seats when Congress opened. Then they formed their own joint committee on reconstruction. This committee -- not the Senate or the House of Representatives -- would make many of the decisions about reconstruction. Radical lawmakers took other steps to seize control of reconstruction efforts in the South. Congress had established a government agency to take care of black refugees in the South. The agency gave food and clothing to former slaves who had no food, money, or jobs. It began to teach them to read and write. Republicans in Congress moved to extend the life of the agency and increase its powers. They passed a bill and sent it to the White House for the president's approval. President Johnson vetoed the bill. He said it would create false hopes among former slaves. He also said it was unconstitutional. The radicals tried to overturn Johnson's veto. However, they failed to get the necessary votes. Congress passed several other bills giving the federal government power to protect the rights of blacks in the southern states. President Johnson vetoed these bills, too. He said they interfered with the rights of the states. These defeats made the radicals even more angry. Their newspapers began a steady attack against the president and his policy toward the South. Some even accused him of treason. Many Americans agreed with this criticism of President Johnson. They gave the radicals a big victory in congressional elections of eighteen sixty-six. Radical leaders gained the power to pass any bill they wished, even over the president's veto. And they wasted no time doing just that. Time after time, they voted to overturn Andrew Johnson's vetoes. The atmosphere in Washington became very tense. Relations between Congress and the White House sank to their lowest level in history. The political skies darkened. Soon, the storm broke. The radicals tried something that had never been tried before. They tried to remove the president from office. The conflict between the radicals and Andrew Johnson would provide some of the most historic and intense moments in American history. That will be our story in the next program of THE MAKING OF A NATION. Our program was written by David Jarmul and Frank Beardsley. The narrators were Shep O'Neal and Tony Riggs. Transcripts, podcasts and historical images from our series are at www.unsv.com. You can also comment on our programs. And we invite you to follow us on Twitter at VOA Learning English. Join us again next week for THE MAKING OF A NATION -- an American history series in VOA Special English.